Service: Nurse, Medical Department, US Volunteers, Columbian Hosp., Washington, DC. 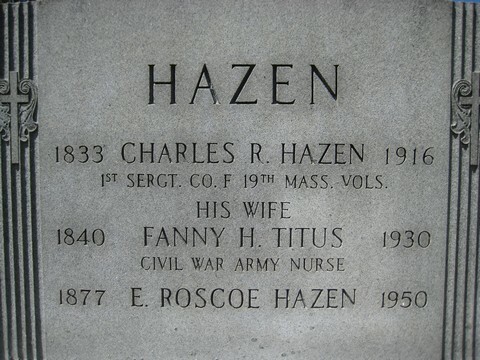 FANNY TITUS HAZEN, President of the Massachusetts Army Nurse Association, is a native of Vershire, Vt. She was born May 9, 1840, being the eldest of eleven children of Simeon Bacon and Eliza Jane (Morris) Titus. Her parents are now living at her home in Cambridge, Mass., her father being eighty-five years old and her mother eighty-four. Mrs. Hazen's paternal grandfather was Joseph Titus, born in Royalston, Mass., son of Lenox Titus, of Royalston, who marched to the relief of Bennington during the Revolution. Her maternal grandfather, William Morris, was clerk of the military company which marched from the town of Woodstock, Conn., on the Lexington alarm, April, 1775. He served in this capacity only ten days. Appointed on March 7, 1778, Second Lieutenant in Captain Daniel Tilden's company, he served as Quartermaster in Colonel Samuel McLellan's regiment, which enlisted for one year's service from March, 1778. The official record says: this regiment "appears to have enlisted in Tyler's brigade under Sullivan in Rhode Island, August- September, 1778." Fanny Titus attended school when three years of age, walking a mile to the schoolhouse and never missing a session during the term. She had already been taught the alphabet by her grandmother Titus, and could spell words with two syllables. When five years old she studied with great interest Peter Parley's geography. She frequently accompanied her father in his journeyings of many miles through the Vermont hills. At the age of seven she often drove seven miles to the mill with a load of wheat, waited until it was ground, and then took it home. In the spelling matches ,which were popular in those days she "spelled down" the entire school, although the youngest contestant. Before she was seven she was taught to spin, and was well drilled in all branches of domestic work. Just before she was thirteen she travelled alone to the home of her grandmother Morris in Lawrence, Mass., going by stage. While living at her grandmother's in Lawrence she attended the Oliver Grammar School, always, before starting for school at eight o'clock, washing the breakfast dishes for forty boarders. This task she performed daily for more than a year. By invitation of the school committee of her native town she then returned thither and taught until she was eighteen. As a teacher she was very successful, introducing the advanced methods she had learned in Lawrence. Going again to Lawrence in 1858, she found employment in one of the large mills, reserving one evening each week for herself and one for the church. She was interested in the Free Baptist church of that city, of which she became a member at the age of seventeen, being baptized in the Merrimack River. The work in the mill was not so congenial to her as teaching, but its financial results were better. Leaving the mill on account of an accident, she remained in Lawrence and took up dressmaking, being thus engaged at the beginning of the Civil War. Her eldest brother, James M. Titus, enlisted in 1861 in the Fourth Vermont Regiment, was wounded at Gettysburg, July, 1863, and in the same year died of disease at Warren Station, Va. In November, 1863, two younger brothers, Morris P., eighteen years old, and Joseph L., seventeen, having enlisted in the Fourth Vermont, Fanny returned to the old home in Vershire to spend Thanksgiving with them and to say farewell. They left the next day for the front. Morris was taken prisoner at Cold Harbor and sent to Andersonville, and was exchanged in the fall of 1864. He died in December, 1900. Joseph was wounded in the head at the battle of Cold Harbor, Va., 1864, and died the following February in a field hospital, after returning to duty from a furlough home. Yearning to be helpful to her country in its time of peril, Fanny Titus offered her services to the Sanitary and also to the Christian Commission, but the officials of both replied, "You are too young." And so said Dr. Hayward, of Boston, adding, "It would be of no use to send you: Miss Dix would send you right back." She secured letters of reference from the Rev. George H. Hepworth, pastor of the Church of the Unity, Boston, and from Dr. Steadman and Dr. Willard, of Boston, and the last of March, 1864, went to Washington. Her first call was at the office of Surgeon-general Hammond, who said it would be useless for her to see Miss Dix, but gave her some encouragement, however, by promising his endorsement if any surgeon in charge of a hospital would give her a position. This would place her on record as a regularly enrolled army nurse. Dr. Bliss, of the Armory Square Hospital, shortly promised to give her the care of a ward as soon as the new barracks were built. While waiting for this appointment, she improved the time by visiting hospitals. She also sought a conference with Miss Dix, and, being kindly received, spoke of her brothers -the eldest of whom had given his life for his country, the other two being then with the Vermont brigade in Virginia-and of her desire to care for the sick and wounded soldiers. After listening to her story and reading her letters, Miss Dix asked her several questwions, one being in regard to the amount of baggage she had brought from home. She replied, "A large and a small valise." Miss Dix commended her good sense in taking so little, and added: "Child, I shall not say no, though it is entirely against my rules to take any one so young. I believe your heart is in the work, and that I can trust you. I shall send my ambulance to-morrow morning to take you to Columbian Hospital, there to remain in quarters till I send you to Annapolis. In the meantime you will be under the training of Miss Burghardt. I have so instructed Major Crosby." Columbian Hospital was on Fourteenth Street, Washington, and was in charge of Dr. Thomas R. Crosby. Shortly after, Miss Burghardt having been granted a furlough for rest, she was placed in temporary care of her ward, the surgeon of which was Dr. F. H. Marsh, of Michigan. By request of Dr. Crosby she was retained at the Columbian Hospital, and upon the return of Miss Burghardt was assigned to Ward Two, where she remained until June 27, 1865, when the hospital was closed. Her experiences while in charge of this ward have been recorded by Mrs. Hazen in the history of "Our Army Nurses." She thus refers to the summer of 1864: "The hospital was filled in May with wounded from the Wilderness. Then came the battle at Spotsylvania and June 1 the battle of Cold Harbor. From the latter battle-field my youngest brother was brought to my ward. At the first I was so rejoiced to see him alive I did not feel sorry that he had been wounded. After each arrival from the front all who could be moved were transferred to hospitals more remote, to make room for the next arrivals from the battle-fields, until at last the wards were filled with very badly wounded men, some soon crossing to the other shore, others lingering for months, suffering untold agonies ere the longed-for rest came. Still others lived to carry through life crippled bodies. Many were the letters written for those unable to write to the dear father, mother, brother, sister, or sweetheart, and many the letters received with thanks from the absent friends. "During June, July, August, and September our heads, hands, and hearts were taxed to the utmost. . . . There were many deaths, each one, as the last hours came, saying: 'Oh, please, Miss Titus, stay with me. It will be but a short time. You seem so like a sister.' So hour after hour I watched the life-light flicker and die of many noble men whose lives were a sacrifice for their country. . . . Later we had our bright days, too, when wit and song prevailed, and occasionally had time to make (as the boys said) 'pies and other things like what we had at home.' The boys would bring the tables from the rooms, placing them end to end through the hall, making a long table, where all the men able to leave their beds sat down to a home-like meal." Mrs. Hazen relates the case of Sergeant Eli Hudson, of Pennsylvania, who was wounded in the knee in the spring of 1865. He was a mere boy, but had served over four years, and had for several months been a patient in her ward. The surgeons had held several consultations, but he was failing rapidly, his disease being hemorrhage of the stomach. When the verdict was given that he could live but a few days, Mrs. Hazen asked permission to give him what he wanted to eat while he lived; and the doctor surrendered the entire charge of him to her care. She says: "I at once removed the bandages, as he complained that they were uncomfortable. As soon as the patients were all cared for, I went to a market-garden and bought a head of cabbage. He had often said he wanted something green. When the cabbage was cooked, I carried him some with cider vinegar. He ate all on the plate, asked for more, which was brought, and still a third and fourth plate, till he had eaten the whole cabbage. From that dinner in May he began to improve, and on the 14th of June I started with Sergeant Hudson on a stretcher for his home." He recovered, but had a stiff knee. At this time the demand for lemons, jellies, farina, and other delicacies was so great throughout all the hospitals that the Sanitary and Christian Commissions' supplies were exhausted. Mrs. Hazen, remembering that the Rev. Dr. Hepworth had said to her, "If you ever need hospital supplies, let Mrs. Bird, chairman of the Aid Society, know what- is needed, and we will send direct to you," sent a letter to Mrs. Bird. This appeal was received in Boston Saturday evening and read in Dr. Hepworth's church the next day. Before night three large boxes were filled and started for Washington. They contained three hundred dollars' worth of supplies. Mrs. Hazen received them with delight, distributing them not only to the boys in her own ward, but to all the wards of Columbian Hospital. She says: "The Aid Society also sent beautiful flannel shirts, socks, towels, and everything to fit out all my boys when able to return to the front. The girls in the Everett School, Boston, sent two barrels of books through one of the teachers, Mrs. Emma F. W. Titus, many of them new publications, purchased expressly for the soldiers." Miss Dix visited the hospital every month, and called all the nurses to meet her in the matron's room. Mrs. Hazen pays the following loving tribute to her memory: "She always came for me, saying: 'Child, go quickly as possible. Tell the nurses I wish to see them without delay.' She was kind and thoughtful for all, but very strict in enforcing all her rules and regulations. She never wasted a minute, and had no patience with those who were slow. I shall ever remember Miss Dix with the warmest love and gratitude, and with the greatest reverence decorate her grave in Mount Auburn every Memorial Day." After returning from Washington at the close of the war, being prevented on account of poor health from going South to teach, Miss Titus accepted a position in the grammar school in North Chelsea, now known as Revere, Mass. Caleb Richardson was the principal of this school. It was while accompanying Sergeant Hudson to his home, in June, 1865, as above noted, that Miss Titus first met her future husband, Charles Richard Hazen, a native of Hartford, Vt. The wedding took place August 5, 1866, at her home in Vershire, in the same room in which she was born. Mr. Hazen enlisted in the Nineteenth Massachusetts Infantry, and served till April, 1864, when he was honorably discharged. 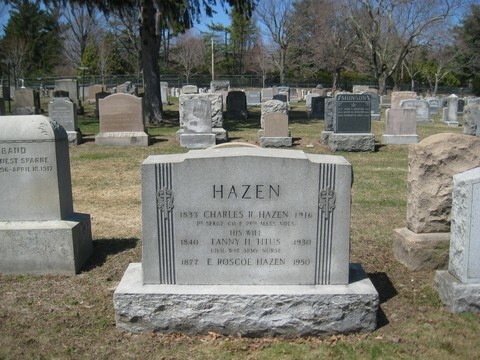 He was a military courier connected with the United States Sanitary Commission, his line of official duty being from Washington, D.C., to Harrisburg, Pa.
Mr. and Mrs. Hazen lived in North Andover, Mass., for two years after their marriage and in Lawrence the next four years. The health of Mr. Hazen was impaired by his army service, and by the advice of a physician he followed the occupation of farming for four years in Chelmsford, Mass., where they bought the "Robbing Hill farm," the highest elevation of land in that part of the State. This property they afterward sold. In September, 1879, Mr. Hazen, being physically unable to continue farm work, engaged in the provision business in Cambridgeport. His invalidism continuing and serious financial losses following the removal to Cambridge, Mrs. Hazen opened a dressmaking establishment, and, as usual in her undertakings, met with success. Dr. Turner, city physician of Cambridge at this time, had been a ward surgeon in the Columbian Hospital at Washington, and knew Mrs. Hazen's capabilities as a business woman. Through the influence of William H. Eveleth, superintendent of grounds at Harvard College, she was given entire charge of Divinity Hall, library and grounds. This position she held for nine years. She then purchased a spacious and pleasant estate on Oxford Street, near the college buildings, in Cambridge, which has been their home for the past fourteen years. She says, "I laid the foundation of my home by work before daylight and by toiling hours after sundown." Four children have been born to Mr. and Mrs. Hazen, and two are now living, namely: Alma M., born May 12, 1868, in North Andover; and E. Roscoe, born June 5, 1878, in Chelmsford. Alma M. married October 1, 1884, Mr. J. Ernest Conant, of West Somerville, and lives in that city. Ernest Willard, born in August, 1872, in Lawrence, died before he was two years old, the result of an accident; and Elbert Titus, born July 6, 1874, in Chelmsford, died May 9, 1881. Charles Beck Relief Corps, auxiliary to Post No. 56, G. A. R., of Cambridge, was instituted in July, 1879, and by invitation of Commander Stone of the post Mrs. Hazen joined the corps at the next meeting. She has held office therein continuously with the exception of one year. She was elected president, but declined to accept the position. For the past fourteen years she has been Chaplain, being the unanimous choice of the members. Her efficient work is appreciated by Post 56, as well as the corps. She attended the annual convention of the Woman's Relief Corps of Massachusetts at East Boston in 1880, the first State convention held after the formation of the department. She has often participated in subsequent conventions, and has served as Department Aide. In 1886 she journeyed to California with the official party, representing the Departments of Massachusetts, W. R. C., and in 1893 was a delegate to Indianapolis. She has also attended other National Conventions. In 1896 the Massachusetts Army Nurse Association was formed at department headquarters, W. R. C., Boylston Building, Boston, Mrs. Mary A. Livermore and other army nurses participating. Mrs. Hazen was elected President, and has been annually re-elected. Its business meetings are held every month at Grand Army headquarters, State House; and public meetings of great interest are occasionally held. The Army Nurse Fair, under the management of Mrs. Hazen and her associates, which was held in Boston, November, 1900, netted a liberal sum to their treasury. A grand relief work is being conducted by this association, and its reunions are second only in interest to those held by the "boys," to whom they once ministered on battle-fields and in hospitals. A record of army nurses and material of value regarding their services has been collected by the association. 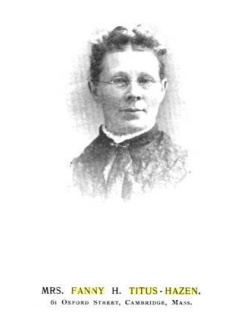 Mrs. Hazen is a member of the Cambridge Equal Suffrage League and (with the exception of one year) has voted for school committee ever since that privilege was granted to women. She is also a member of the Daughters of Vermont. She is serving her third year as Chaplain of Bunker Hill Chapter, Daughters of the American Revolution. Her life has been a busy and useful one. Difficulties she has surmounted with a loyal, courageous spirit, knowing no such word as fail, especially when a good cause has appealed to her for help. Needless to say of one so friendly and faithful, she has many friends, tender and true. 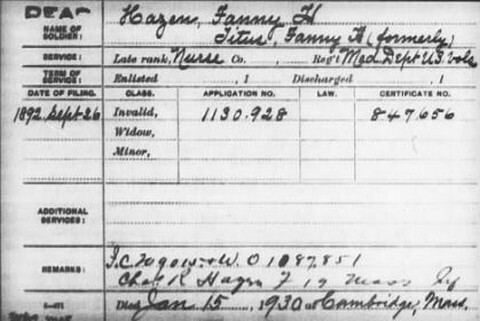 Note: Fanny Titus Hazen received a pension for her service from 1892 until her husband's death in 1916, then as a widow until her death in 1930. Source: Representative Women of New England, by Juliet Ward Howe and Mary Elvira Elliott, New England Historical Publishing Company, Boston, 1904, pp. 466-469. See also - Mrs. John A. Logan, The Part Taken By Women in American History, the Perry-Nalle Publishing Co., Wilmington, DE, 1912, p. 362. Civil War Nurse Dies at Cambridge, Mass., in 90th Year. CAMBRIDGE, Mass., Jan. 15 - Mrs. Fannie T. Hazen, Civil War nurse, died today at her home here in her ninetieth year. Mrs. Hazen was born at Vershire, Vt., on May 9, 1840, the oldest of eleven children. Having a knowledge of nursing, she volunteered in the Civil War, serving for a year and three months. She was at the Columbia Hospital in Washington from April 19, 1864, and there saw her own brother, Joseph, who had enlisted when only 16 years old brought in wounded after the Battle of Cold Harbor. Later, while a nurse, she met Charles R. Hazen of Vermont, an army courier, and they were married. Mr. Hazen died in 1916. Mrs. Hazen founded the Army Nurse Association of Massachusetts in 1896 with a membership of eighty-four, and had been president ever since. The only survivor now is Helen E. Smith of Allston, senior vice-president. Mrs. Hazen was president of the National Association of War Nurses in 1905 and 1906. She was widely known in Massachusetts for her patriotic work.